One of the world’s greatest adventure tourism destinations is being threatened by the plans of Kinross Gold Corporation, of Canada and Geocom Resources Inc. of the United States. These junior level mining concerns are intent on establishing a gold mine along the Rio Espolon, a major tributary of the Futaleufu River. Discovery work was conducted within the claim in 2006 resulting in the release of assay results in April, 2007. Along with substantially high gold deposits, some as concentrated as 20.9 grams per tonne, the assay also returned reports of a “massive” sulfide layer nearly three meters thick within the ore body. 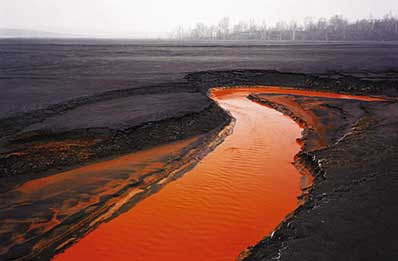 These sulfide layers are notorious for producing Acid Mine Drainage (AMD) – sulfuric acid - a potent environmental poison which is discharged from mine tailings. Furthermore, such toxic drainage can go on for centuries, long after a mine has shuttered its operation. Rather than declare the area unfit for a safe mining enterprise, Kinross Gold Corporation and Geocom Resources Inc. have instead elevated the Espolon Claim to a “formal venture status” thus instigating a confrontation with determined and established environmental organizations(1) and adventure travel outfitters for the future of the region, as outlined below. As for the geographic neighborhood of the mine, on the western border of the Kinross-Geocom claim lies Pumalin National Park (8), Chile’s largest and newest nature sanctuary, founded by American entrepreneur and passionate conservationist Douglas Tompkins(9). Tompkins, who made his fortune founding the Esprit and North Face apparel companies before discovering the Shangri-La of Patagonia, is vehemently opposed to the gold mine as well as the road that must be built through Pumalin Park to sustain it. (10) An "industrial thoroughfare" through and bordering the park he founded is not something he envisioned. The above mentioned trip also happened to include Robert F. Kennedy Jr. and Chilean Senator, Antonio Horvath. 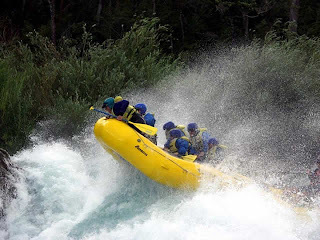 According to the outfitters, who run adventure trips on the river, there are many other celebrities who vacation in the Futaleufu Valley, incognito, that will gladly volunteer to shed their anonymity to help publicize the plight of the Futaleufu - virtually ensuring that the fight over this river will become long and protracted. If geographic location were not inauspicious enough for this proposal, what lies between the ore bearing lodes is the pièce de résistance of environmental foreboding and abuse. As reported in the official Geocom Resources company assay (29), of April 2007, the Espolon Mining Claim contains a “massive” sulfide layer composed of the sulfur laden compounds of pyrrhotite-pyrite and chalcopyrite. These injurious aggregates, which nature has wisely provided to safely and nearly permanently encapsulate, when exposed to an atmosphere of oxygen and water, of which the Patagonia region has no shortage, devolve to form sulfuric acid. (30) While acid is a valuable commodity (when confined to an automobile battery) to have sulfuric acid freely flowing through the environment is another matter altogether. Abundant water and epic storms mean acid mine runoff and containment difficulties. Water is another element of concern in the extremely sodden environment of Patagonia, Chile. Anyone who has spent any significant time in this area is bound to encounter the epic rains that frequently soak this region, sometimes for weeks at a time. It is not unimaginable that one of these storms could inundate the Espolon Mine forcing a release of toxic tailings waste into the environment, as was the recent case with the Red Dog Zinc Mine in Alaska. "As I've told you folks here in the past, we can't stop discharging unless it stops raining," Kuals said. "Until that happens we must discharge water or that dam will fill up and overtop and nobody wants that to happen." The Espolon Mine will require vast amounts of toxic cyanide to extract the metal from the ore layers. Cyanide is used to process both base and precious metals and is the reagent of choice at modern mines. 85% of the world's gold is produced through the cyanide leach process. 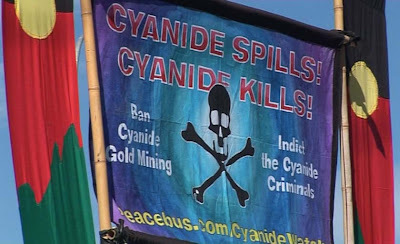 (41)Cyanide leach mining is a hallmark of the Kinross Gold Corporation which is petitioning the EPA in the United States to implement the technology at mines it owns in Alaska. (42) Cyanide spills can cause longterm problems for local communities like Futaleufu which lies directly downstream of the mine. Pit Mine Blasting - Will the "daily blast" rock the Futaleufu River Valley? Take a tour of various Kinross Gold Corporation properties from around the world. For all practical purposes, this IS the future of the Futaleufu River Valley, these mines look all alike. 1. The processes involved in surface mining offer few job opportunities for unskilled labour. 2. Where they can be absorbed, they are discriminated against. Using the very same logic these miners employ one could argue that the dismantling of the Pyramids of Egypt would offer local Egyptians the same perks during the destruction and the very same disadvantages after it was over (lack of tourists) – albeit without the centuries of subsequent environmental heavy metal contamination. Gold mining produces nothing of practical value. 1] The mine is located in an ecologically sensitive triangle between the Pumalin National Park in Chile, Los Alerces National Park in Argentina and the spectacular world-class tourist destination of the Futaleufu River Valley. The land already has a use as world-class international tourist destination. How can a gold mine of this magnitude exist without degrading the environment and scaring away international travelers? 2] The mine claim area contains vast amounts of Sulfide which will cause Acid Rock Drainage (ARD) and Acid Mine Drainage (AMD). This mining proposal, if approved, will be the dirtiest type of gold mine possible. The effects on the aquatic life in the Espolon and Futaleufu River Valleys will be devastating. The result will affect every fishing lodge and aquatic dependent business in the watershed, including possibly the Salmon Industry in the Golfo Corcovado sixty miles downstream. 3] The Espolon Mine will use vast quantities of toxic Cyanide in the extraction process. 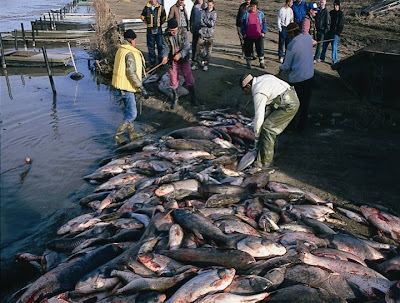 The cyanide will be present in tailings waste containment ponds waiting for the inevitable flood which will send toxic water down the Espolon into Futaleufu River, as was the case on the Danube River in Europe. Additionally the cyanide can leak from the containment areas and infiltrate the ground water making it unfit for human consumption for decades after closure. When this happens will Kinross Gold & Geocom Resources be around to monitor and ameliorate the environmental problems they caused? 5] Daily pit-mine blasting in the Futaleufu Valley will drive away international tourists and wildlife. If the residents of the valley are lucky there will only be one seismically recordable blast a day. However, because the Espolon claim is so large, it is possible that there will be more than one open pit, which will require more than one explosion. 6] The mine region has no infrastructure to support heavy industry. Within the region there are limited roads and a limited electricity supply. All equipment for the mine, including cyanide for the leeching process, will need to be transported through Pumalin Parque or the Futaleufu River Valley. Both of these are unacceptable from a tourism perspective. 7] The Futaleufu River Valley is fast becoming one of Chile's greatest international tourism destinations. The pure, translucent teal colored waters of the Futaleufu River make it one of the most photogenic rivers in the world. Will tourists visit an area whose streams, lakes and rivers have been compromised beyond recognition? 8] Gold is a decorative metal with very limited use outside the manufacture of adornments. Is it worth the price of destroying one of the last pristine wilderness areas on the earth to produce it? The desire for gold has been the historical driving force behind the destruction of entire civilizations in the Western Hemisphere - do we need to add the Futaleufu River Valley as well?